Chapter 6. What they call interstitial activity. In vocab school or very posh artisanal games I guess. For our needs, the bits between the dungeons. There’s a swiftly despatched essay on linking and foreshadowing, but then it’s on to the meat. Making and Do-ing. Back in the day, there were all kinds of things characters could do when they were not actively adventuring, like build towers, or gather followers, that sort of thing. Largely this acted as a way to relive them of the stupid amounts of cash that they would acquire from the modules. As well as that, it was about some kind of Endgame, or Lord level play, which was something for PCs to aim for. Now, that never was a motivation for me and mine, not then, not now. We play D&D for loads of reasons, with heroic adventure top of that non existent list, and grinding out a day job as a carpet seller isn’t on there. I don’t begrudge anyone having these things if that’s what they want, it just seems like a lonely kind of fun to me. Crafting. Professions. Training. All very real, but who wants that level of reality in their fantasy? Who am I kidding. Loads do, see Pathfinder. To make it work for me, I simply need to bring those activities back to the centre of the gaming. Building a stronghold won’t be the plot of the scenario, but it could absolutely be a backdrop or springboard to such. That’s where this DMG shines, it makes the accounting actions gameable. It runs as a kind of expansion to what the players already got in their handbook. The list now includes; building strongholds, carousing, crafting, training, planting rumours and others. Each gets no more than a para or two (rather than the entire supplement each would have produced before) and occasionally some rulesyness in the form of a chart or table. There’s nothing here that wouldn’t fit in the PHB, so I wonder how many players will spontaneously ask for carousing results without being aware of these rules? I should mention crafting in particular. This sort of activity, backed by rules, is the sort of thing that gets fans very exercised indeed. Fora have these little blooms of magic item economy threads every now and again. Like crafting itself, a very isolated kind of fun. I’ll talk more about this in the next chapter, but essentially, your wizards aren’t encouraged to be manning the lab benches so much any more. What rules there are, are simple, and refer you directly back to the DM should you try to destabilise the world they spent the first five chapters setting up. Odd chapter. If this downtime stuff is your thing you might feel shortchanged. For me, it’s just about right, and gives me enough and no more. As a precursor to the next chapter, it works. 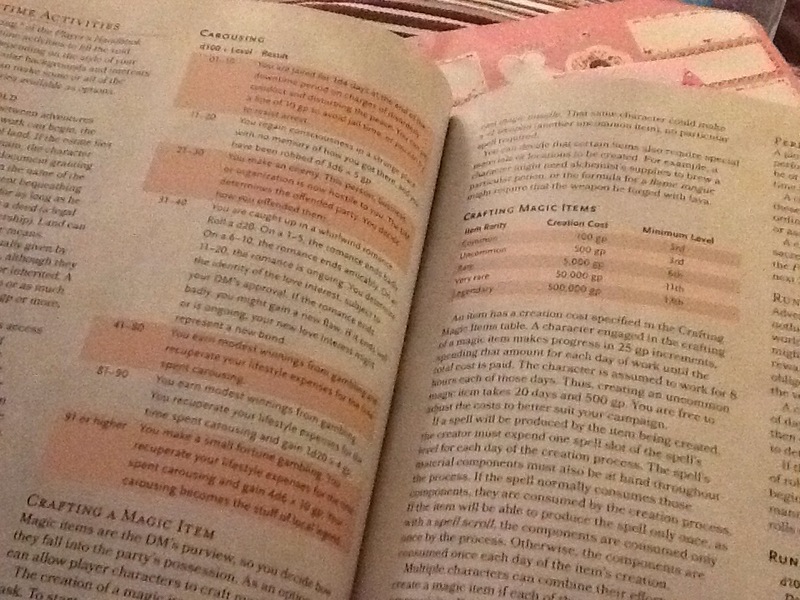 And as the next chapter is the Magic Items one, I’d better get cracking. There’s a lot of them! Crafting seems to be a big thing; it’s a major part of most online rpgs and when there were no rules for crafting in the PHB I saw a lot of people complaining and — I’m not joking — proclaiming that D&D5 was a terrible game for not including such rules. I don’t get it myself. A game that lets me make imaginary furniture isn’t anywhere near as exciting to me as a game that lets me fight imaginary monsters, but each to their own, I suppose.